The Apache web server is at the heart of IT infrastructures in various domains - Healthcare, Banking, Trading, Logistics, etc. To ensure scalability and high performance, most web sites are being architected to use a multi-tier model. In such architectures, the Apache web server plays a pivotal role since all users to the other tiers are routed via the web server and so any slowdown or problem in the web server tier adversely impacts the end user experience. The availability of a web site and the response time for user accesses to the site are the most critical metrics of web performance. Both these metrics may vary depending from one website to another and even from one transaction to another. 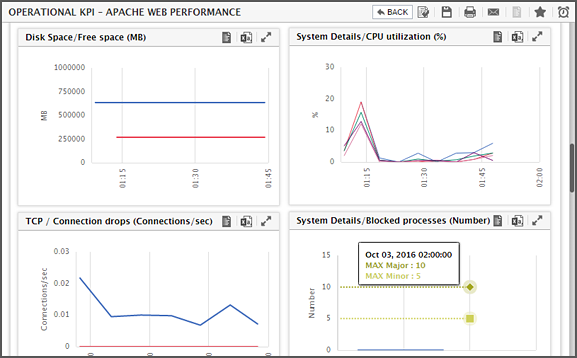 Today’s Apache monitor must be able to report the availability and response time for individual user transactions to a web site. eG Enterprise adopts a unique two-pronged approach for web transaction monitoring. The external agent uses request emulation to assess the user experience from different locations. By doing so, the external agent captures the effect of the network latency and the server-side processing time on the end user experience. To quantify the server processing times for real user requests (not emulated requests), the eG internal agent deploys a proprietary web-adapter technology. This technology enhances Apache web servers with the capability to track HTTP/HTTPS requests to a web server and the corresponding responses. For each transaction that is configured for monitoring, the web adapter analyzes the request URLs and responses to report various metrics relating to individual web transactions in real-time. eG agents are able to monitor Java (Servlets, EJB, JSPs) and other non-Java implementations (ASP, PHP, CGI, etc.) as well. Since it is able to monitor real-user transactions to web servers in real-time, eG Enterprise can proactively monitor and quantify all anomalies that may occur in a web infrastructure. The ability to offer real-time monitoring of 100% of the real user transactions, without the need for explicit, expensive logging is a key distinguishing feature of eG Enterprise's Apache monitoring capabilities. 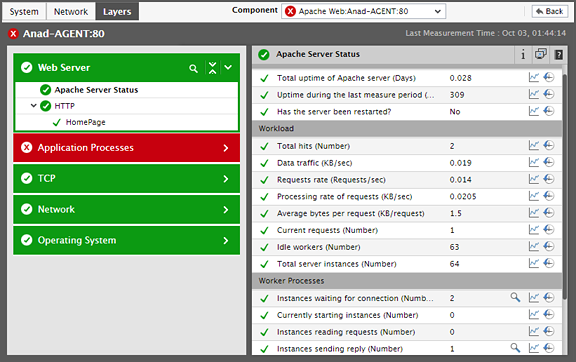 This one-of-a-kind monitoring capability supports other popular web servers as well. Is the web site available for user accesses from different locations? What is the response time for user accesses to the site from different geographic locations? Is a slowdown due to increased network latency or due to increased server-side processing? How are the critical transactions of a web site functioning? What is the request rate for each transaction? What is the average response time for each transaction? Are there many aborts for the transaction? What is the status of the different web sites hosted on a single web server? Are there many errors occurring in the system? Are the servers supporting the web infrastructure adequately sized? Are there usage trends that need to be accounted for future capacity planning? Is an increase in server-side processing time due to the web server or due to the middleware application server or due to the database? Is the load being effectively balanced across all the web servers? Are the critical web server processes up and running? Webinar The 7 myths of virtualized application performance: Why is my app so slow?